We’ve received a record number of amazing applicants across the country for the new EMRA Simulation Vice-Chair position and we are thrilled to see so many eager, talented physicians interested in promoting the field of simulation. We will be reviewing the final selection with the EMRA Board and will announce the Vice-Chair on Basecamp. I hope you find these newsletters useful, and as always, if you have any questions, comments, or would like to become more involved in the division, do not hesitate to reach out. Over the past several months we have been able to plug close to a dozen members in to Sim-related projects/initiatives. Email us if you are interested - simulation@emra.org. #1: EMRA Simulation Vicechair Selection Process – Official Decision to be Announced Soon! As stated in the introduction, we were thrilled to have so many applicants for the Vice Chair position. Official decision TBA in 2018! 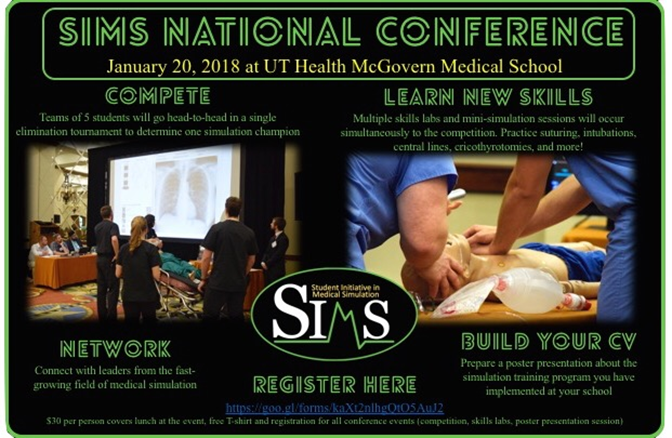 UT Health McGovern Medical School is hosting the first SIMS National Conference on Jan 20, 2018. This is a national organization dedicated to increased student exposure to simulation, so students from all parts of the country are welcome. This is a full day event, with opportunities for medical students to present posters, network with leaders in the field of simulation, high-fidelity scenarios, and exciting skills labs. Registration is $30 per student, which covers entrance to the event, registration for the competition, all skills labs, lunch, and a free T-shirt. Register here: https://goo.gl/forms/YwlAD0aUYs5P77Xm2! As a sneak peek, I’ve been in contact with Dr. Lau on his simulation project: A Just-in-Time, In Situ Pediatric Procedural Sedation Simulation Program for Emergency Medicine Residents and he is finding very interesting results. As previously mentioned, we are hoping to expand this scholarship to provide additional monetary support for amazing simulation projects. So the more applications, the more we can request EMRA to fund this scholarship! Please continue to send us submissions during the next award cycle! We will be positing a link to the Simulation website on creating a simulation program geared towards medical students, as developed by the creators behind SIMS – Student Initiative in Medical Simulation. 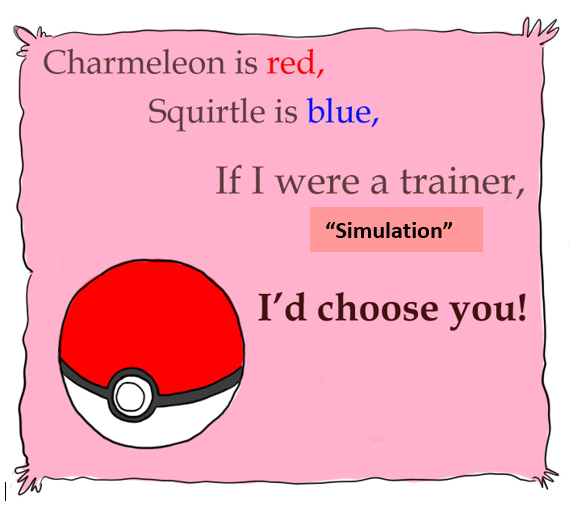 Link: http://www.joinsims.com/simulation-resources. This website contain SIMS initiative and resources done in a very professional manner. Please take a look either on our website or in this newsletter. We had record response and interest from those interested in contributing to case writing for ACEP17. We were able to accommodate all interested parties, getting them place in groups tasked with writing cases for the upcoming SimWARS event! Let’s keep up the momentum for SAEM 2018! Keep your ears and your creative juices flowing! Anticipate concrete deadlines in Feb 2018. Message from SSIH representative - “The Formal Training Affinity Group in affiliation with the Society for Simulation in Healthcare has developed a ‘Fellows Forum’ and would like to invite simulation fellows and trainees to join. This is open to any and all simulation fellows/trainees in all professions, disciplines and degrees. You DO NOT need to be a paying SSH member! You need to create a (free) online SSH account and follow the instructions below to join. You can then set your account to send you updates when other fellows or moderators post. To clear up confusion, you do not need to be a paying SSH member to sign up for an online account. Any interested simulation fellows/trainees who are not formal SSH members can still sign up for an account and join the forum. The intention of this group is to provide a peer-moderated safe place for current fellows and trainees to get information and share experiences. #7: ‘CHAOS’ is coming to CORD 2018!!?? This project is gaining amazing momentum from both the EMRA board and EMRA Committee Leaders. Everyone who’s heard ANYthing about this mysterious event wants to do EVERYthing just to get in on the action. Details are still shrouded in secrecy (well, except for Nick and I), but we have something amazing planned for CORD 2018, a competition that has never been done before in the history of EMRA. Definitely keep your ears peeled for this exciting event! More details to come later. #8: Please review the “Old Business” section (below) for prior updates that are still relevant! Background The utility of simulated mortality remains controversial in the literature. We therefore sought primarily to determine whether there was a difference in performance for residents exposed to varying levels of simulated mortality during training scenarios. As a secondary objective, we also sought to determine whether their self-reported anxiety levels, attitudes toward, and engagement in the simulated encounters differed based on group assignment. Methods Fifty junior anesthesiology residents were randomized to one of the three simulation cohorts. The residents were broken into groups that either always experienced simulated patient survival (never death), always experienced simulated mortality (always death), or had a variable result based on performance (variable death). All residents experienced 12 identical training simulations with only the predetermined outcome as the variable. Residents were brought back 6 weeks after initial training for four assessment scenarios and subsequently rated on nontechnical skills and anxiety levels. Results Residents in the always and never death groups showed no difference in nontechnical skills using the Anesthetists' Nontechnical Skills Score before and after the simulations. Residents in the variable death group, however, had improved nontechnical skill scores when brought back for the assessment (45.2 vs 41.5 and 42.9 respectively, P = 0.01). Although all three groups had higher State-Trait Anxiety Index scores from baseline after training, only the always death group had higher anxiety scores during the assessment (43 vs 37 vs 37 P = 0.008). Conclusions We found that participants who experienced simulated mortality that was variably delivered, and more directly related to performance, performed better on later assessment scenarios. As mentioned last month, EMRA will be hosting its spring meeting at the CORD Academic Assembly. The EMRA webpage is revamped and we’ve heard really great feedback from end-users. We are actively trying to keep all site information up-to-date, as well as provide links to simulation resources and past newsletters. Feel free to make suggestions regarding content you would like added to the page. We are continuing to compile a NEW compendium of pediatric simulation in collaboration with the great minds behind the Introduction to Simulation, an Educational Guide for Medical Students. If you are interested in being listed as a contributing author to a potential EMRA publication (which makes for an attractive add-on to any CV), please email simulation@emra.org for detailed information and how you can get involved! Many division projects are underway! Stay tuned for updates.